J. 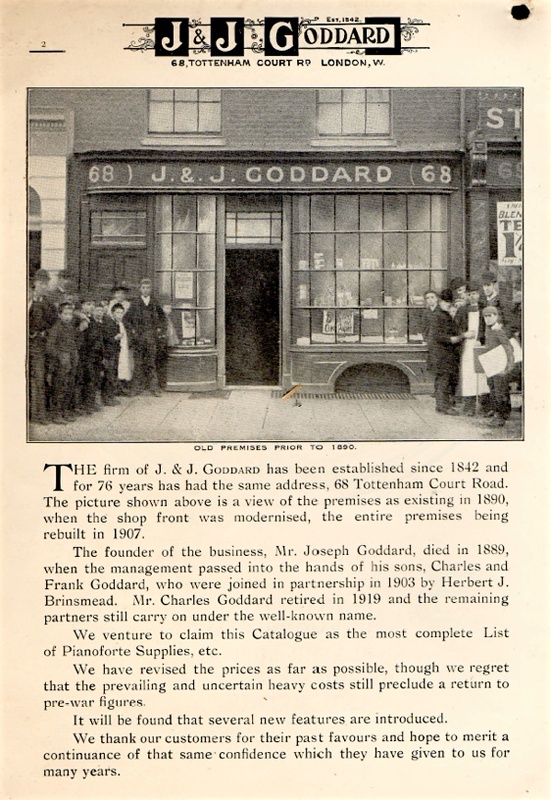 & J. Goddard was at 68 Tottenham Court Road until 1968. The last address I could find for them was at 37 Union Street SE1, London, in 1970. I hope that these children were not involved in child labor. This looks like a lot was happening at Goddard’s in 1850. 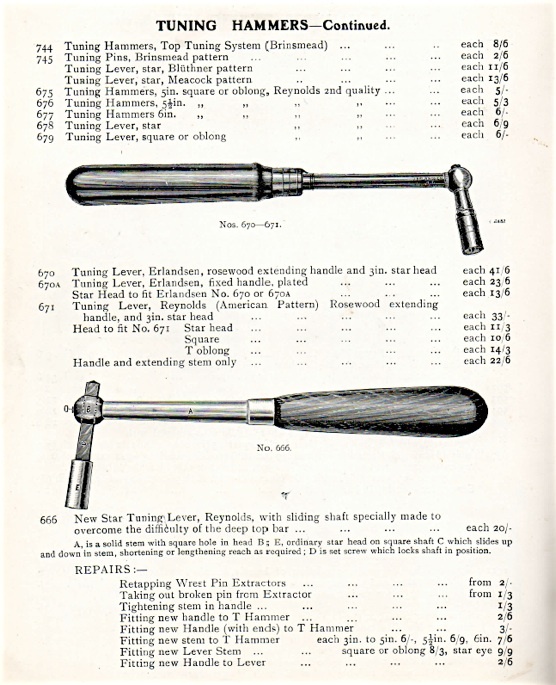 Many tuning hammers were available in Goddard’s 1920 catalogue. 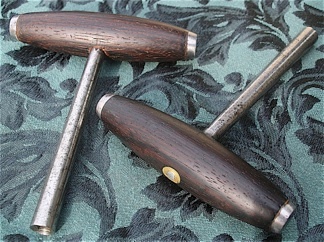 “T” hammers and universal tuning hammers were plentiful in 1920, while in North America, “T” hammers were no longer used for tuning, but still used for stringing. They’re still used for stringing today. Reynolds tuning hammers were prominently featured. Richard Reynolds, “music smiths; Tuning hammers and Tuner’s kit for tuning and repairing” operated from 4 Upper Rathbone Place, London, circa 1885, and into the 1890s, at least. Rathbone Place runs directly parallel to Tottenham Court Road. I did find a Richard Reynolds in the census files: in 1891, Richard Reynolds, born 1852, was living in London with his wife Helen, and six children living at home. Reynolds listed his vocation as “Ironmongers and packer.” Reynold’s son, Richard Jr., was an “ironmonger’s assistant.” Products from the Reynolds shop would like likely be packed to deliver locally, such as for Goddard and George Buck over on Tottenham Court Road, as well as be shipped to the distant corners of the British Empire. At the time of the 1901 census, five children were living at home with Richard Reynolds and his wife, Helen, and he stated his profession as “ironmongers and stockkeeper.” In 1921, as shown in “The Music Trade Directory,” vol. 32, R. Reynolds was located at L.W. S. R. Arch, 192 Stamford Brook Station, Hammersmith, W. “Tuning hammer and tuner’s kit maker.” W. J. Reynolds and Sons, “music smiths,” were listed at 192 Arches, Goldhawk Road, H. in 1940. This was the latest entry that I could find for this business. 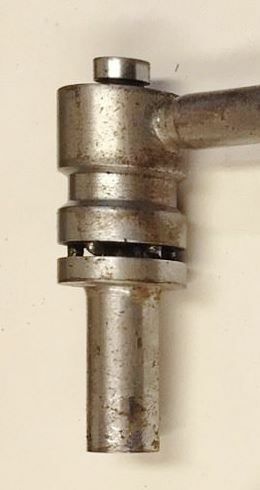 Reynolds tuning lever with square socket, not pictured above. All steel, with hollow ground screwdriver inside the handle. Reynolds products shown in these photos strike me as no-nonsense and utilitarian — but very well made. 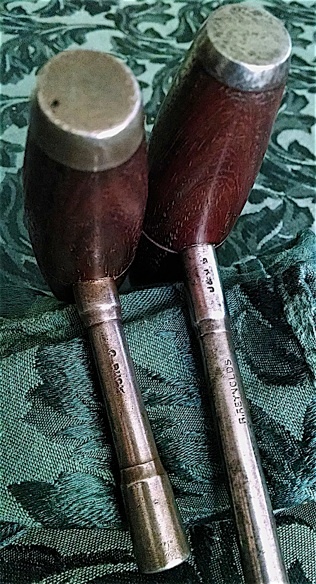 Two R. Reynolds tuning hammers with dealer markings and hard mahogany handles. On the right is a signed R. Reynolds with “J.& J. G,” and on the left is a George Buck hammer with what looks like R. Reynolds filed off. 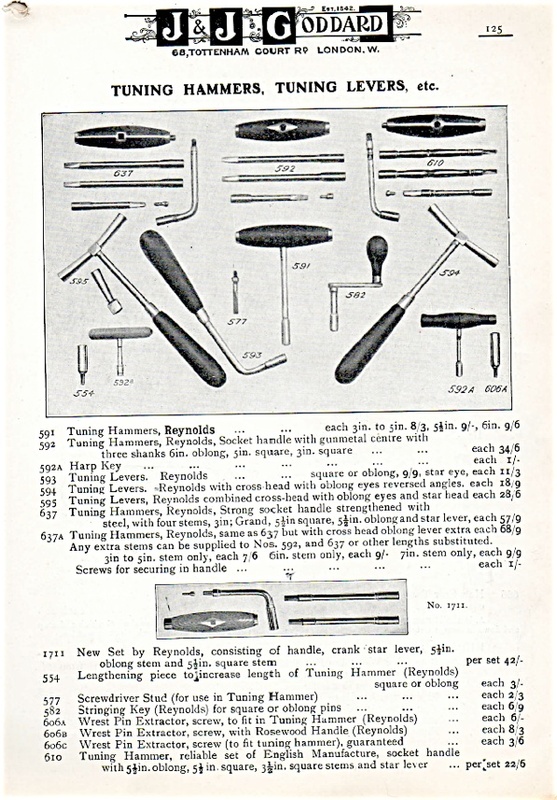 Buck and piano tools: Music Trades Directory 1912. 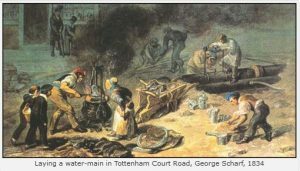 George Buck was another tool dealer, just up the street at 242 Tottenham Court Road. 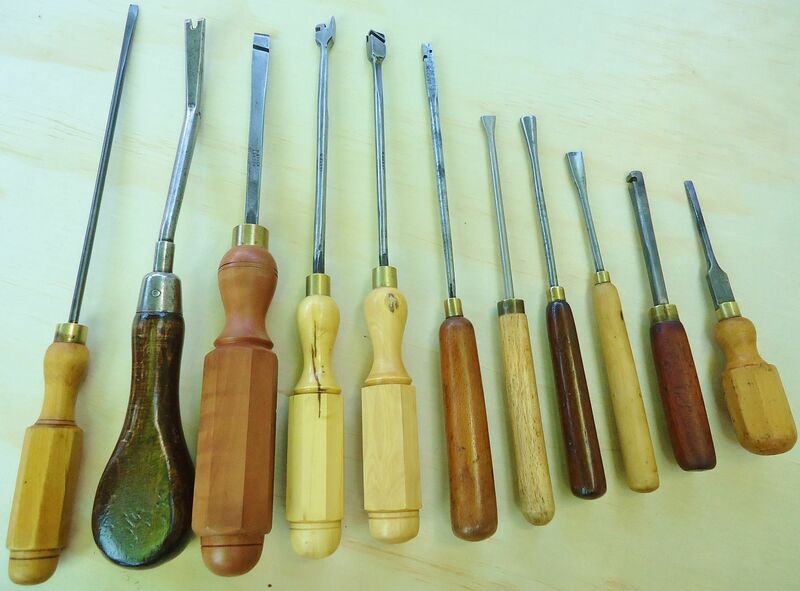 They catered to many trades, which included a line of piano tools. 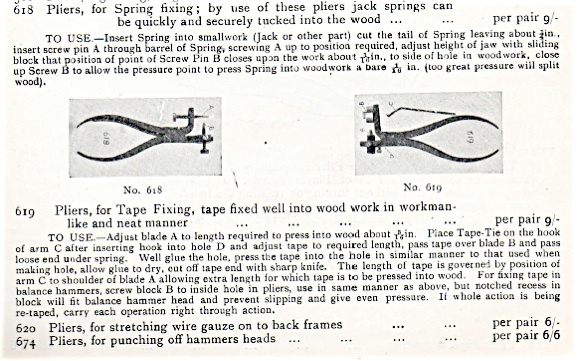 Buck wire gauge and tuning hammers ILL. Weekly Journal, Jan. 12, 1895. Slip gauge for music wire, sold by George Buck, 245 Tottenham Court Rd. London (earlier address), c. 1840-1860. Papp’s mute The Musical Times, vol. 29, c 1888. 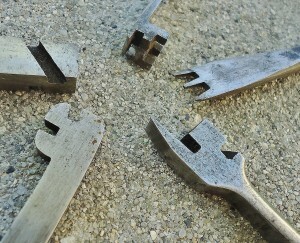 Set of older Reynolds hammers, oblong socket, and square socket. J.& J. Goddard tuning lever with walnut handle, made by Reynolds, bottom; R. Reynolds heavy duty lever with hard mahogany handle, top. Stock number 610, a “reliable set of English manufacture.” The small illustration in the catalogue hardly does it justice. More ornate than Reynold’s work, this hammer looks like it could have been made a century earlier. Well made, with four carefully fit rosewood infill pieces, it’s hard to see why tuners would pay more for Reynolds hammers. This speaks to Reynold’s reputation, as his equivalent sets were roughly twice as expensive. All of the attachments were marked “STEEL.” This STEEL inscription also appears on a number of English and Scottish infill planes. Universal English tuning hammer, Goddard stock number 610. Download version. This came as a set, inside a custom-made leather fold-out. R. Reynolds Universal tuning hammer. No 637 in the 1920 Goddard catalogue. 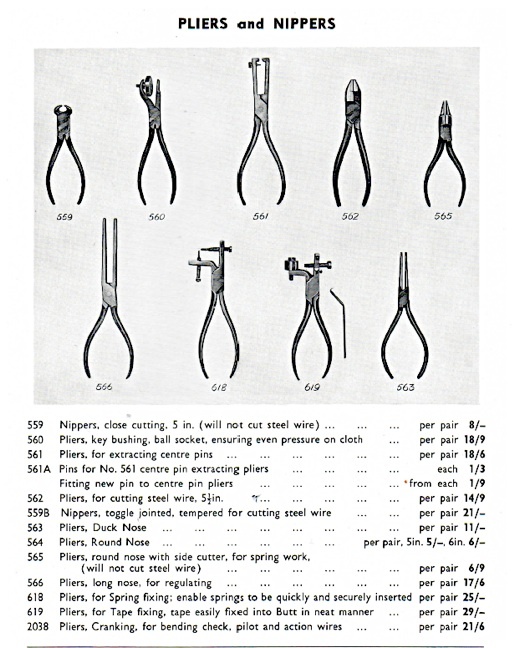 Erlandsen had “more than a national reputation,” as quoted in a 1918 article in the “Music Trades Review.” Erlandsen tools were also featured in the Otto Higel Co. catalogues, out of Toronto, Canada. Goddard’s no. 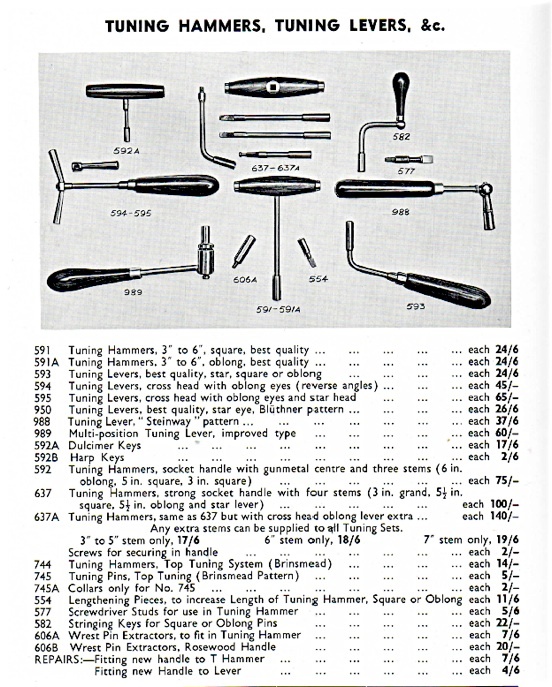 90 c. 1940s catalogue, with one page of tuning hammers compared to two pages in 1920. Reynolds was not mentioned. No. 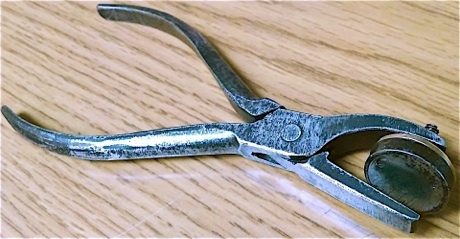 988 is the ‘Steinway” pattern lever that was later offered by Fletcher and Newman and by Heckscher Ltd. Reynolds was carried extensively in Goddard’s no. 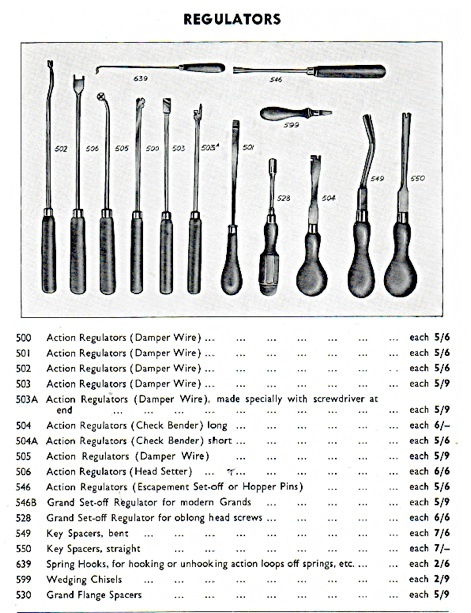 70 c. 1930s catalogue, as well as Erlandsen tuning hammers. No. 989 was intended, at least partially, for sight impaired tuners. No 989, revolving head close up. 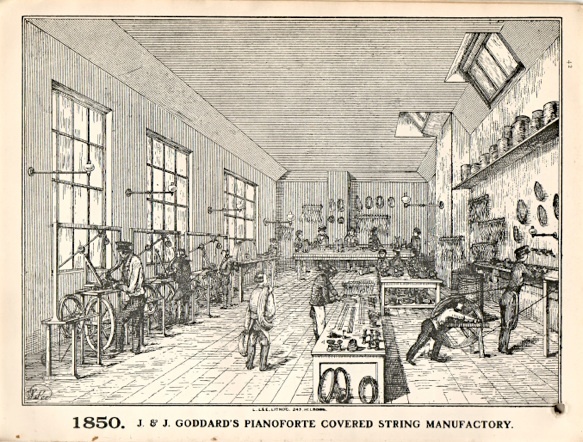 The British piano supply catalogues became progressively shorter over time, sadly reflecting the decline of the piano industry: Goddard no. 50 c. 1920, 204 pages; Goddard no. 70, c. early 1930s, 144 pages; Goddard no. 80, c. late 1930s, 120 pages; Goddard no. 90, c. 1940s, possibly early post war, 84 pages; G. F. Baker, c.1950, 48 pages. Fletcher & Newman’s 1959 and 1976 (centennial) catalogues were larger at 100 and 90 pages respectively, but they consisted of a merger between H. J. Fletcher and Newman & Morgan, which subsequently bought out G. F. Baker and J. S. Tozer. ‘Steinway pattern’ lever by Fletcher & Newman Ltd., 1970s. The hammer has F. & N. marked on the shaft, and is compatible with Renner, Stuttgart heads. Its handle is a light mahogany (but darker than this photo in my monitor), with a thick hard finish that appears to have been dipped. Standard English crank tuning lever, with a square socket, sold by H. J. Fletcher. It’s very short, so it was intended for tuning pianos with less tuning pin torque, with beech wrestplanks, etc. 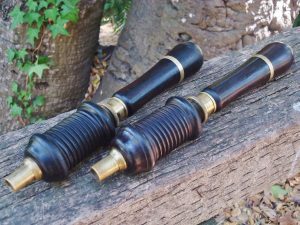 Extra care has been applied in its making, with features such as a large steel pin running through the ferrule, rosewood handle, and steel shaft to prevent any slippage. On the gooseneck shaft, extra steel has been welded to the inside of the bend to add structural integrity. 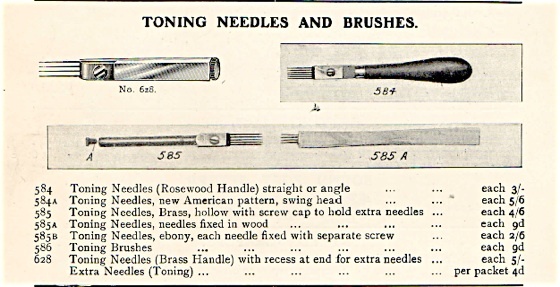 Voicing tools in the 1920 catalogue. Nos. 584 (foreground) and possibly an earlier version of 585 (middle). No. 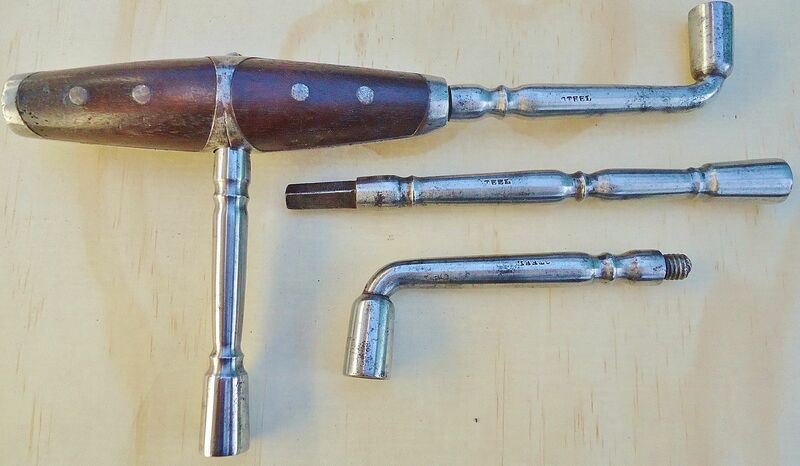 584A was the imported Hale adjustable voicing tool, which was shown in the no. 70 catalogue, circa 1935. 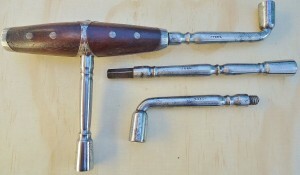 A British copy of the Hale adjustable voicing tool was shown in the 1950 G. F. Baker catalogue, and the same tool was shown in the 1976 Fletcher & Newman catalogue—Baker was bought out by them. I have not seen a patent for this type. 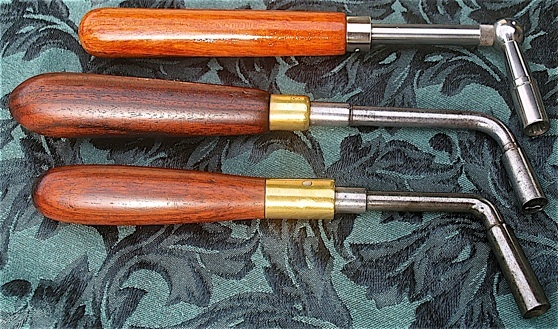 Two Buck bow drill stocks, found together, one is rosewood, and the other is dark rosewood with the spool possibly ebony. 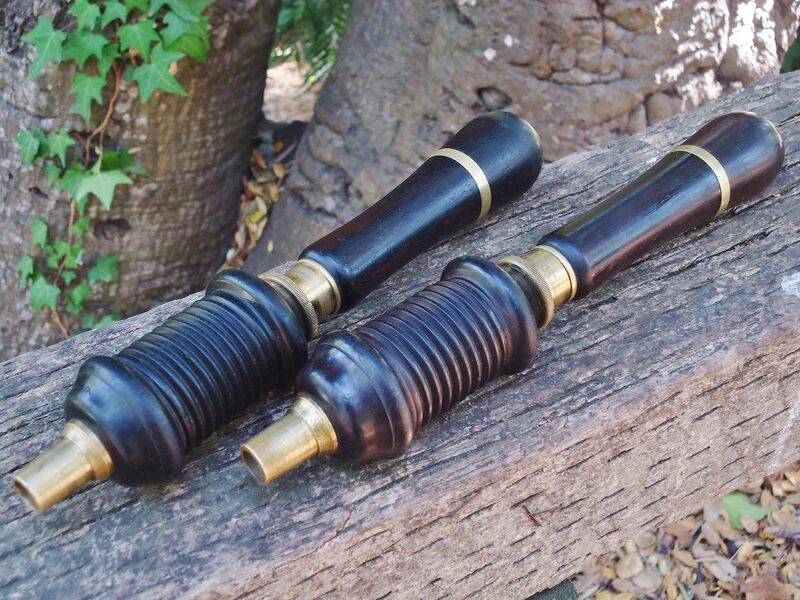 The rosewood drill is shorter and narrower than the darker one, but the shape of the handles suggest that they were made at the same time. Both Buck drills likely were used on the same factory shop floor. 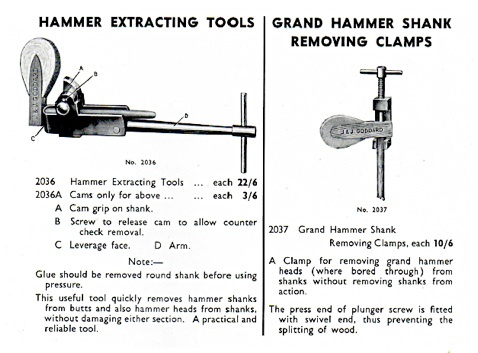 G.F. Baker hammer extractor, with provisional patent, and Baker string coil lifter, based on a screwdriver. 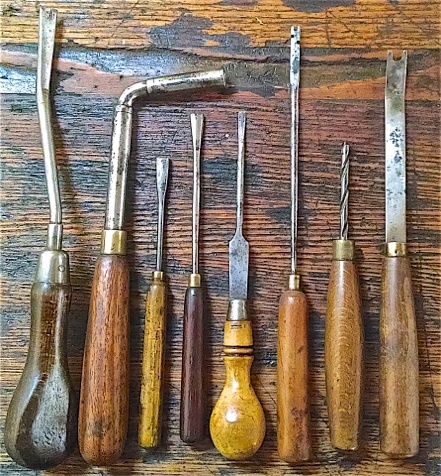 Piano tools made by W. Baker, London. William Baker appeared in the 1881 UK census, listed as a tool maker born c 1837, in London. Not sure if this is an older relative of G. F. Baker. W. Baker offset piano screwdriver. Goddard’s unique cloth, felt, and leather cutting machine. In restoration, these materials are being cut to custom widths constantly. c. 1920. No. 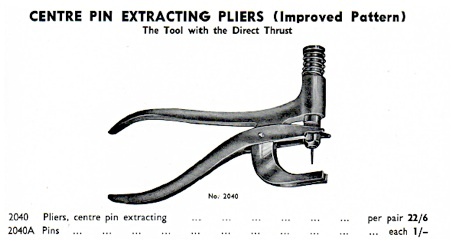 561, based on Wynn Timmons pliers; extracting pin moves on a sweep rather than direct thrust. No. 560, key easing pliers, ball socket. 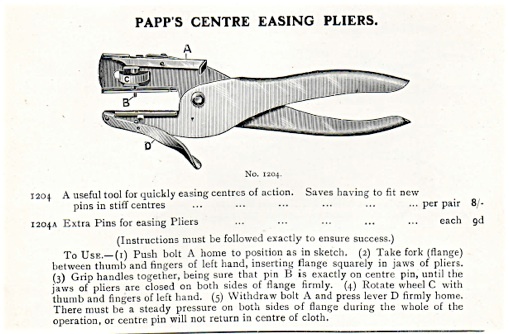 Parallel piano pliers–meaning that the jaws are parallel at the width of an average piano action part. Sold by George Buck. Similar to #566 in the Goddard catalogue. 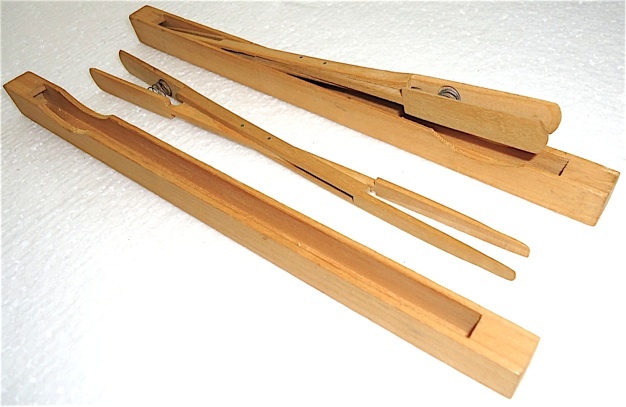 Papp and Son, pianomakers, Portsmouth, U.K. is best known for their tweezer mutes, which were patented in 1886. 1940s. Three tools on the right are actually based on Sheffield type screwdrivers. More English regulating tools, some duplicates, some not. 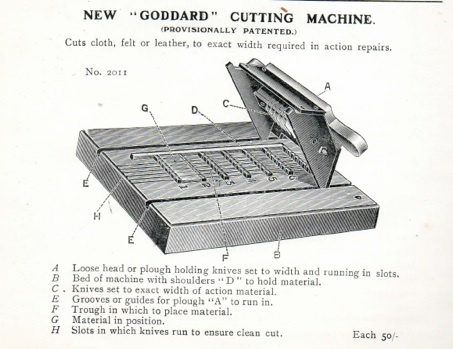 Goddard carried a large selection of planes, including a comprehensive range of wooden bench planes and Stanley iron planes. 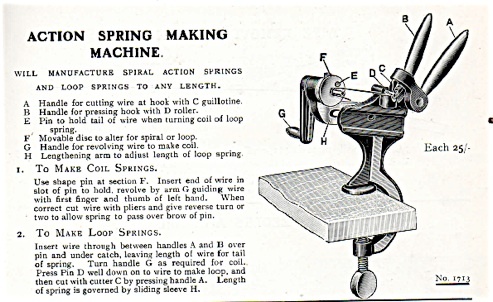 Goddard wrote, “any pattern plane supplied” in their 1920 catalogue. 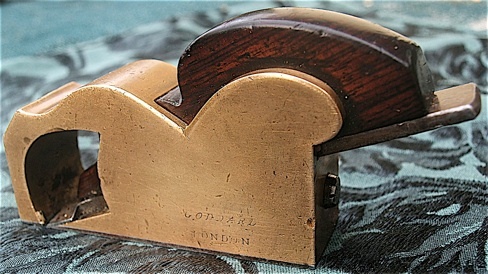 This steel-soled gunmetal bullnose plane has “Goddard London” inscribed on its side, which is partially visible in this photo.